Azure Database for PostgreSQL is a managed service that enables you to run, manage, and scale highly available PostgreSQL databases in the cloud. Using the Azure portal, you can easily manage your server and design a database. An Azure Database for PostgreSQL server is created with a defined set of compute and storage resources. The server is created within an Azure resource group. 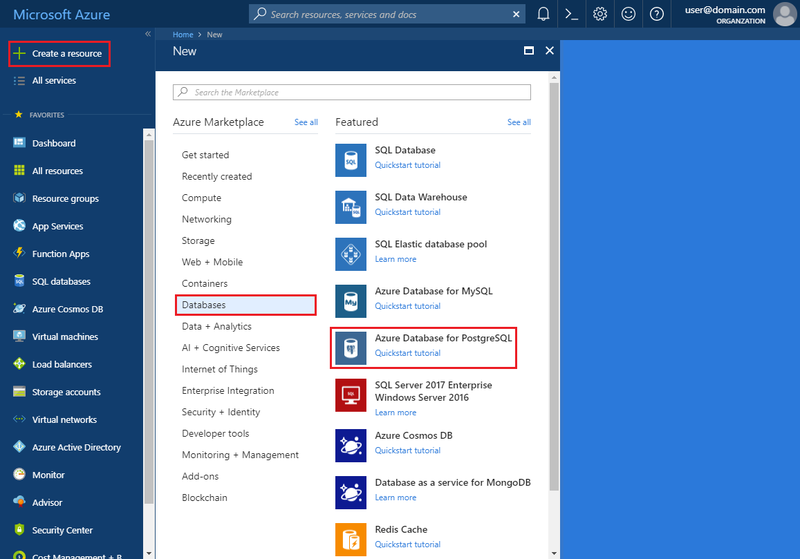 Select Databases from the New page, and select Azure Database for PostgreSQL from the Databases page. Subscription: If you have multiple subscriptions, choose the appropriate subscription in which the resource exists or is billed for. The server admin login and password that you specify here are required to log in to the server and its databases later in this tutorial. Remember or record this information for later use. Click Pricing tier to specify the pricing tier for your new server. For this tutorial, select General Purpose, Gen 5 compute generation, 2 vCores, 5 GB of storage and 7 days backup retention period. Select the Geographically Redundant backup redundancy option to have your server's automatic backups stored in geo-redundant storage. Click Create to provision the server. Provisioning takes a few minutes. Check the Pin to dashboard option to allow easy tracking of your deployments. By default, postgres database gets created under your server. The postgres database is a default database meant for use by users, utilities, and third-party applications. The Azure Database for PostgreSQL service uses a firewall at the server-level. By default, this firewall prevents all external applications and tools from connecting to the server and any databases on the server unless a firewall rule is created to open the firewall for a specific IP address range. After the deployment completes, click All Resources from the left-hand menu and type in the name mydemoserver to search for your newly created server. Click the server name listed in the search result. 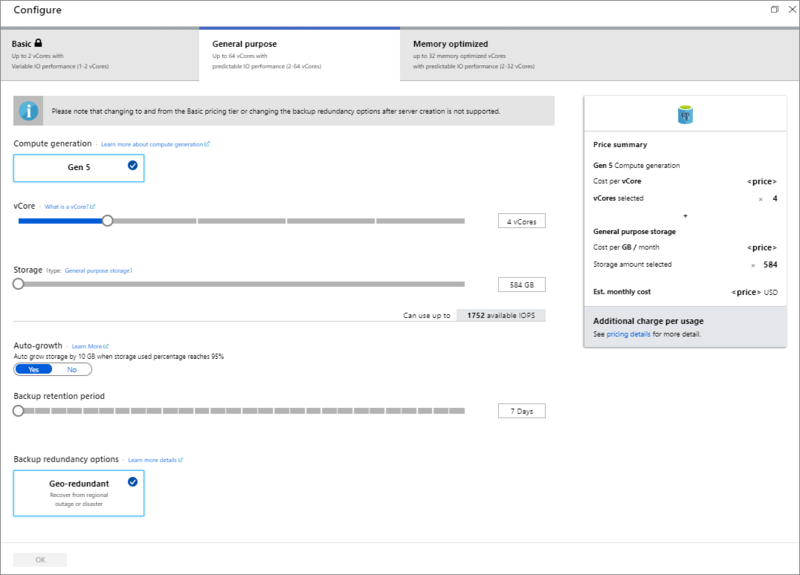 The Overview page for your server opens and provides options for further configuration. In the server page, select Connection security. Click in the text box under Rule Name, and add a new firewall rule to whitelist the IP range for connectivity. Enter your IP range. Click Save. Click Save and then click the X to close the Connections security page. Azure PostgreSQL server communicates over port 5432. If you are trying to connect from within a corporate network, outbound traffic over port 5432 may not be allowed by your network's firewall. If so, you cannot connect to your Azure SQL Database server unless your IT department opens port 5432. When you created the Azure Database for PostgreSQL server, the default postgres database was also created. To connect to your database server, you need to provide host information and access credentials. From the left-hand menu in the Azure portal, click All resources and search for the server you just created. Click the server name mydemoserver. Select the server's Overview page. Make a note of the Server name and Server admin login name. Let's now use the psql command-line utility to connect to the Azure Database for PostgreSQL server. Launch the Azure Cloud Shell via the terminal icon on the top navigation pane. The Azure Cloud Shell opens in your browser, enabling you to type bash commands. For example, the following command connects to the default database called postgres on your PostgreSQL server mydemoserver.postgres.database.azure.com using access credentials. Enter your server admin password when prompted. Once you're connected to the server, create a blank database at the prompt. At the prompt, execute the following command to switch connection to the newly created database mypgsqldb. You have now two rows of sample data into the inventory table you created earlier. Execute the following query to retrieve information from the inventory database table. You can also update the data in the table. You can see the updated values when you retrieve the data. Imagine you have accidentally deleted this table. This situation is something you cannot easily recover from. Azure Database for PostgreSQL allows you to go back to any point-in-time for which your server has backups (determined by the backup retention period you configured) and restore this point-in-time to a new server. You can use this new server to recover your deleted data. The following steps restore the mydemoserver server to a point before the inventory table was added. On the Azure Database for PostgreSQL Overview page for your server, click Restore on the toolbar. The Restore page opens. Pricing tier: You cannot change this value when restoring a server. It is same as the source server. Click OK to restore the server to a point-in-time before the table was deleted. 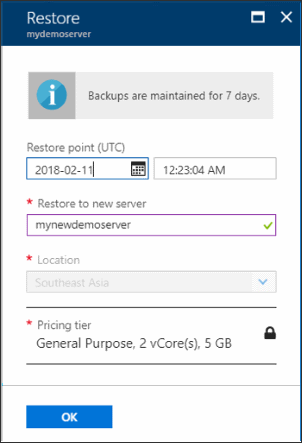 Restoring a server to a different point in time creates a duplicate new server as the original server as of the point in time you specify, provided that it is within the retention period for your pricing tier.